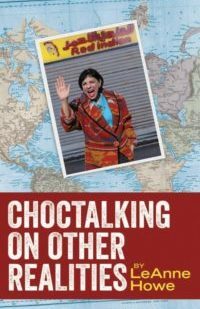 The collected stories/essays in Choctalking on Other Realities, by Choctaw author LeAnne Howe, depict, with wry humor, the contradictions and absurdities that transpire in a life lived crossing cultures and borders. The result is three parts memoir, one part absurdist fiction, and one part marvelous realism. The collection begins with Howe’s stint working in the bond business for a Wall Street firm as the only American Indian woman (and ‘out’ Democrat) in the company, then chronicles her subsequent travels, invited as an American Indian representative and guest speaker, to indigenous gatherings and academic panels in Jordan, Jerusalem, Romania, and Japan. In this extraordinary collection, LeAnne Howe does for Choctaw storytelling what The Hunger Games does for archery—makes something seemingly traditional and archaic feel edgy, new, and necessary. Dean Rader: Author of Engaged Resistance: American Indian Art, Literature and Film. Choctalking is LeAnne Howe at her very best. Who else can mix hard-hitting social commentary with wicked wit and good old fashioned storytelling? Howe is a true citizen of the world and the relative at the party who can’t stop telling the truth. This is a book that belongs in classrooms and book clubs, too. Everyone should read this book. Everyone. LeAnne Howe is a mound builder of story. Like earthworks that gather far-flung nations and connect worlds above and below, these exquisite tales of travel and cross-cultural encounter align across geographies and generations, across embodied research and archival adventure, across wry humor and speculative analysis to reveal unexpected pattern, relationship, theory. What emerges is sophisticated and complex, engineered not simply to endure but to spark future performance, to provoke story building of the reader’s own. This collection of LeAnne Howe’s demonstrates the power, compassion, and at times riotous American Indian humor of a master storyteller. With a deep commitment to Southeastern American Indian perspectives on tribalography and tradition, Choctalking on Other Realities spans indigenous worlds from New Orleans to Amman, Jordan. The words throughout these pages illuminate deeper histories of embodied indigenous knowledges, and tribal practices. With Howe as a guide, readers are invited to confront the global ironies of Indianness with wisdom, laughter, and grace.